We're now accepting proposals to present at the Catholic Writers Conference Live, July 30-Aug 2, in Lancaster, PA. Find more information on the session proposal form. 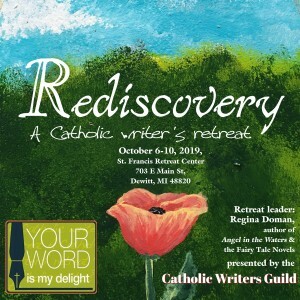 Join CALA-winning author Regina Doman for a retreat that's truly for writers while also being truly Catholic. The schedule includes 3 talks, 12 meals, social time, Mass, confession, Benediction -- and 29 hours of writing time! The CWG Prayer Chain Post is a weekly post for members to include their special intentions by adding a comment. The power of prayer and the power of people praying. Please leave a comment with your intention. If you have problems adding an intention, email it to Mike Hays at coachhays(at)gmail(dot)com and I will add it. God bless. Holy Family, guide our minds, our hearts, our hands, as we write, speak, illustrate – help our words to live in union with the Word. Teach us discipline and skill to use the talents God gives us. Give us also insight and courage to convey God's love through our craft, and humility to be open to His divine will, shaping our lives, in loving loyalty to His Church. Not sure where to go next? View the new member welcome page! Not seeing the full site? Check your account. If your membership is expired, you can renew. Welcome! If you'd like to learn about membership, select Joining the Guild. To learn about our events, visit pages for the Live Conference, Online Conference, and Writers Retreat. You're welcome to join our weekly chat, Sun 9pm EST, in the CWG Chat Room. Please visit our list of Seal of Approval recipients and Catholics Arts and Letters Award winners. You can find many of our authors, illustrators, and editors through member sites and our CWG Blog. Need a great presenter? Visit our Speakers Bureau page. Use the CMN Store Finder to locate a bookstore in your area.